Let’s round ’em up! I imagine that’s what cowboys would say, wiping the grit from their brow as the silhouettes of cattle block the setting sun. Me? I just turn off my oven, put the last plate in the dishwasher, and settle down at the computer. Well, last month, when my husband and I attended a “cowboy” wedding, we had a taste of the real wild west in Tulsa, Oklahoma. 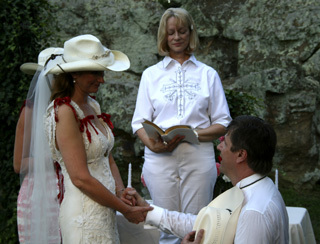 Our dear friends, Nick and Lisa, decided to tie the knot in true down-home cowboy fashion — literally! Secretly, I feared for us Yankees. Would we be comfortable in our new ‘required’ cow clothing? 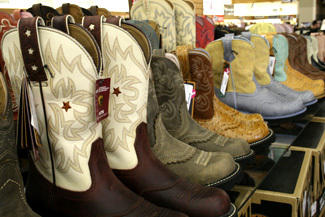 Drysdale’s Western Wear was the first stop. 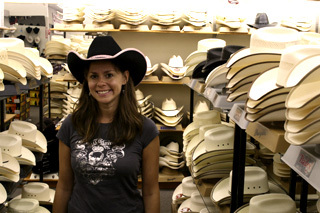 A warehouse lined from top to bottom with cowpoke paraphernalia, surely they would have something we could wear. Cowboy hats were a must! And as a transplanted New Yorker, of course, I instinctively reached for black. Geeze, that doesn’t match my dress the inner girlie-girl reminded me. Noticing my distress, the saleswoman promptly brought over a gorgeous white felt Stetson with a gold plated band that fit perfectly. But at $220 dollars, I reconsidered and opted for straw instead. Now that we had our duds, we wanted to experience some real old time Western culture. We rode off (in our car of course) towards Woolaroc, an expansive ranch and museum started in 1925 by Frank Phillips, famed oil tycoon. 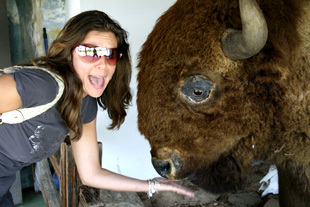 As we approached the museum, we were in sore need of grub, so we hit the snack stand that served barbequed buffalo, what else? Tender and lean, this was barbeque well worth the trip. The rule of the west? Eat or get eaten… It might look like payback time, in the next shot with the immense buffalo but luckily I still have all my fingers and thumbs! Ole wooly here has a vacuum in his mouth that leads to an underground garbage container so that he can gobble up bits of trash from visitors. I kid you not! The ranch hands assured me that all the taxidermy animals here died of old age as part of Phillips private wild life preserve, but you still have to wonder where they get their barbeque from! We’ve got some serious museums back home, but I do declare that I was impressed by what I saw next. Wild artifacts including clothing from 40 American Indian tribes, thousands of fine art paintings, and the most incredible collection of guns that I have ever seen. What appealed to me most about the museum, beyond all the history, was the intense beauty and artistry of each and every item. I mean, everything was handmade. 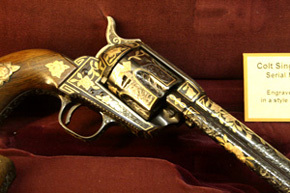 Even the guns that might have some pieces forged or produced by machines had the most delicate hand-carved hilts, covered with gold, silver, mother-of-pearl, and sometimes even large diamonds and saphires. It was time to head back to our own homestead, to rest up for dinner and reunite with the happy couple Nick and Lisa. As we drove down the country roads, the landscape was flat as a patch work quilt. We passed through the heavy iron gates of Skelley Lodge where the wedding party was staying. Nick gave us the grand tour amidst the greenery dotted with hundreds of butterflies, dragonflies, and hummingbirds that buzzed lazily around the property. The creak of an old chuck wagon pulling up in the drive immediately caught my ear. “The caterers have arrived!” Nick exclaimed as I marveled at an authentic chuck wagon that dated back to the turn of the century. Where’s the stove I thought, as the chef pulled out a series of impossibly heavy iron Dutch ovens and started to build a fire. 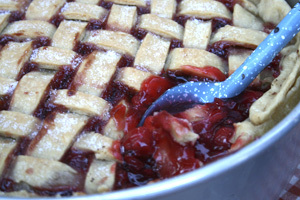 This cherry cobbler would be baked with hot cinders until the sun set and it was time for dinner. Ribs, beans, and homemade buttermilk bisquits rounded out the menu. The chef told me quite a few things about cooking and traditions of chefs in the old west. 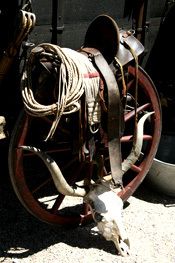 The chuck wagon, created sometime around 1860, by Charles Goodnight – what a great name, right? “Cookie” as they often called the chef, didn’t seem like the proper name for someone who labored under grueling conditions, often cooking in the rain and getting up in the middle of the night to keep vigil on his daily lot of rising bread dough. Chuck Wagon chefs had the reputation for being a crabby lot, but no wonder! It was invented as a sort of kitchen on the go for cowboys during long cattle drives, imperative for traveling, hungry men for hire. It also served as the gathering spot for socializing, throughout the day and mostly evening. In rare instances, when the chef was in a good mood, he’d whip up some pie or cobbler for after dinner, the perfect time to tell tall tales around the flickering fire light and handle any disputes the cowboys might have had since Cookie was by far the toughest cowboy of them all. 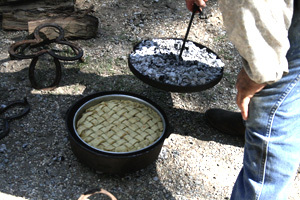 As our “Cookie” filled almost all of his Dutch Ovens, the next wave of cowboy guests arrived. 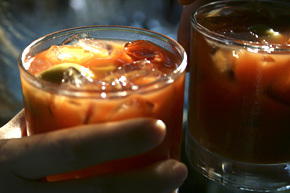 The bartender, stationed on the veranda, set a large glass jar of jalapeno stuffed olives as he smiled warmly. “How about a Bloody Mary?”, he offered, unshaken by the minister who had just arrived, a mystical, glowing woman dressed from head to toe in white. After a quick drink we headed up to the outdoor alter with an ivy trellis beneath the cool side of a mountain covered in moss. Horses waiting at the bottom of the hill and the bride climbed into her white washed carriage to be driven towards a patiently waiting groom. The hem of her skirt brushed past the rose petals that were strewn along the aisle. As the minster began, a deeply personal ceremony, she softened our ears with words of tender love as if they had been created expressly for that moment. Dragonflies played among the lace pleats in the bride’s skirt as the groom removed his hat and fell to his knees to recite more poetry. Rings glided onto fingers and lips met. Fiddles struck up lively chords as the happy claps of the guest echoed through the hills. Wow, sounds like a lot of fun. How come you’ll get to travel so much? I grew up in the OK area, it’s fun to see a New York couple visit.